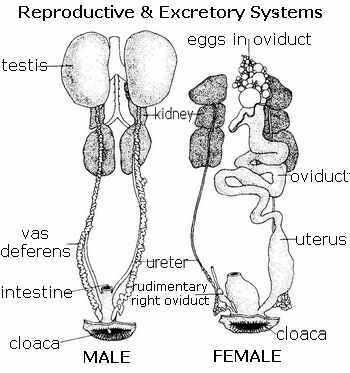 Bird reproduction begins, as in mammals, when an egg, or ovum, is fertilized in the oviduct by contact with a sperm cell. The fertilized ovum forms the nucleus of the egg, which will be equipped with a food source (the yolk) and a protective shell before laying. Certain domesticated birds like chickens and ducks regularly lay eggs without receiving sperm from the male - the eggs we buy in the grocery stores are unfertilized eggs. As yet another adaptation for lightness, the male's testes only enlarge when producing sperm; then they become several hundred times the normal size. Sperm passes to the cloaca in a coiled tube, where it is often temporarily stored. The resulting bulge in the cloaca is used by ornithologists to judge a bird's breeding condition. We use cloacal scores to record breeding condition at our MAPS banding stations. We have a scoring method to record the cloacal protuberance condition: 1=conical, 2=tubular, 3=bulging. It is a gradual progression as the male comes into breeding condition. The female has two ovaries, except in raptors, where it varies individually. Usually only the left ovary develops and like the male cloaca, shrinks after producing the season's ova - another probable adaptation for lightness for bird reproduction. Sperm is transferred to the female during copulation by direct contact of the two cloacas. 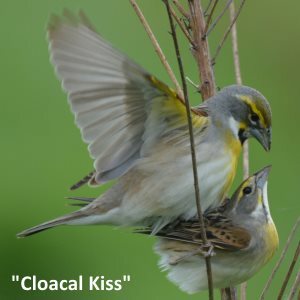 The male briefly stands on the back of the female while the cloacas are pressed together (the "cloacal kiss"). Along with bird reproduction, learn about other Bird Characteristics including: Feathers, Bird Flight, Bird Song, Beaks, and Bird Skeletons. Photo of Dickcissels courtesy of Andy Reago & Chrissy McClarren at Flickr.